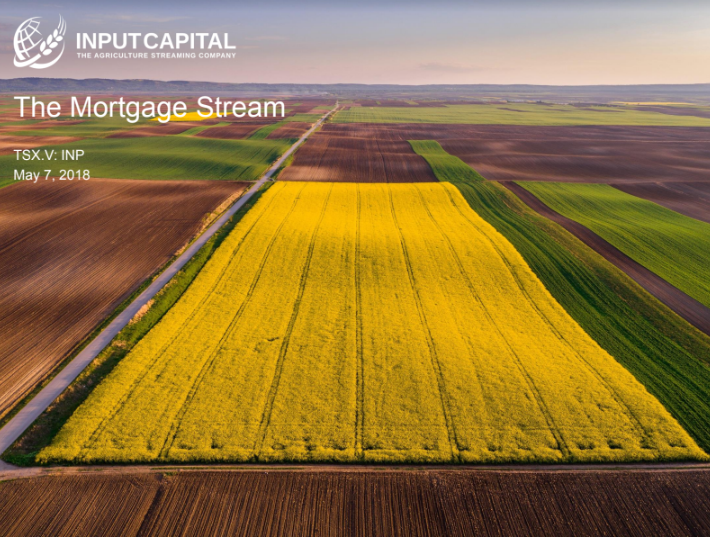 REGINA, March 26, 2018 /CNW/ - Input Capital Corp. ("Input" or the "Company") (TSX Venture: INP) (US: INPCF) is pleased to provide an update on its recently announced mortgage stream pilot project. On January 30, 2018, the Company announced the initiation of a pilot project with the objective of fleshing out the details of a conventional farmland mortgage which would use canola streaming as a payment vehicle. The pilot period would be used to assess market demand for this product and fine-tune product features prior to a more formal launch of mortgage streams as a stand-alone product offering. In the seven weeks since the pilot project launch, the Company has had many discussions with current and prospective clients about mortgage streams and found a significant level of enthusiasm for the idea and a willingness of clients to take advantage of this new product. At the start of the pilot period, the Company had written one mortgage stream in the amount of $400,000. Now, only seven weeks later, Input has approved over $13 million in new mortgage streams with twenty customers. These mortgage stream customers are a combination of new and existing clients of the Company and, as expected, the mortgage proceeds are being used to purchase additional farmland and/or refinance portions of existing mortgages from other providers. Doug Emsley, President & CEO, commented by saying: "This is the most rapid uptake for a new product that we have ever seen at Input Capital. Mortgage streams move Input squarely into the area of farmers' largest capital requirement – land financing. The farmland mortgage market is between five and eight times larger than the working capital needs of farmers. This translates into a tremendous opportunity for us to expand the footprint of our multiple streaming options and deploy capital. We have developed a very strong pipeline of potential mortgage streams which we will be working on in the days ahead. "Now that it is clear that farmers like mortgages which are paid with canola at harvest time, we have begun to actively promote the mortgage stream more widely and integrate it into our standard product offerings. We have also begun a search for low-cost financing in the form of a warehouse or secured debt facility to facilitate the rapid growth of our mortgage stream book. Management is already in discussion with a number of financial institutions regarding this proposed facility and looks forward to being able to report success in this area. Appropriately structured low-cost financing will enable Input to deploy significantly more capital than just the equity on its balance sheet, building a larger book of mortgages more quickly and driving Input's Return on Equity (ROE) to significantly higher levels." Input has also launched a redesigned website, which includes a fresh design, as well as additional information on the various streaming products offered by the company. The website can be found at www.inputcapital.com. Input is an agriculture commodity streaming company with a focus on canola, the largest and most profitable crop in Canadian agriculture. The Company has developed several flexible and competitive forms of financing which help western Canadian canola farmers solve working capital, mortgage finance and canola marketing challenges and improve the financial position of their farms. Under a streaming contract, Input provides capital in exchange for a stream of canola via multi-year fixed-volume canola purchase contracts. To a farmer, Input is like a virtual grain company, buying canola and providing financial solutions. To canola buyers, Input is like a large virtual farm which produces and sells canola over a large geographically diverse footprint, but does not own the land, or equipment or operate the farm. In production terms, Input is the largest canola farm in the world. Input plans to continue to grow and diversify its low cost canola production profile by entering into streaming contracts with canola farmers across western Canada. Input is focused on farmers with quality production profiles, excellent upside yield potential, and strong management teams.